Clean out the cupboards, clear of your stations, and usher in the new year. it's the time of year again for opening windows and enjoying the spring sunshine. It's also time for refreshing your knowledge of how to keep your salon at its cleanest and most inviting. 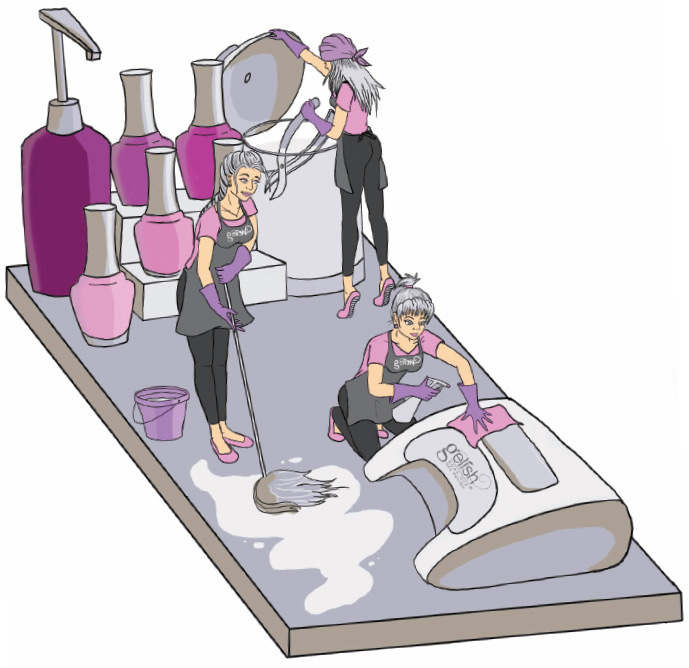 It's hard to over-emphasize how important salon cleanliness is to your business. A clean, safe salon is a number-one concern of most of your clients. You want your clients to feel comfortable in your salon so that they will return — and you want to feel comfortable, too, knowing that the salon environment you have created is a positive one. Where to start? Each state has its own guidelines and regulations for cosmetology and salon sanitation and safety — Google your state board's information online (or you can find a list of all 50 state boards and their websites at www.nailpro.com/state-boards). • Pedicure foot spas — whether whirlpool foot spas, air jet basins, pipeless foot spas, or non-electric foot spa basins or tubs — require cleaning and disinfection after each client, at the end of each day, or at least once during the week. Check with your state board for details about the cleaning procedures and types of cleaning products required for each. • Nail implements such as stainless steel nippers, cuticle pushers, and crystal nail files must be sanitized and disinfected (or sterilized) according to state regulations. Implements like nail files, emery boards, orangewood sticks, and toe separators are meant for one-time, single-client use and should be disposed of after one use. • Reduce the risk of spreading germs by having both nail techs and clients wash their hands before any service. • Keeping your salon free of dust, dirt, and debris goes (almost) without saying — but one space you might not think about? Your retail displays. Dust shelves and rotate products regularly to keep your areas attractive and clean. Today's salon clients are savvy in terms of what they need to ask or look for — so the better prepared you are to answer their questions about salon cleanliness and safety, the more comfortable and confident they will be.